I’m handing the site over this morning to artist Christine Brallier, pictured right, for something totally different — stained glass mosaics. (Have I ever posted about stained glass mosaics? I actually don’t think I have.) 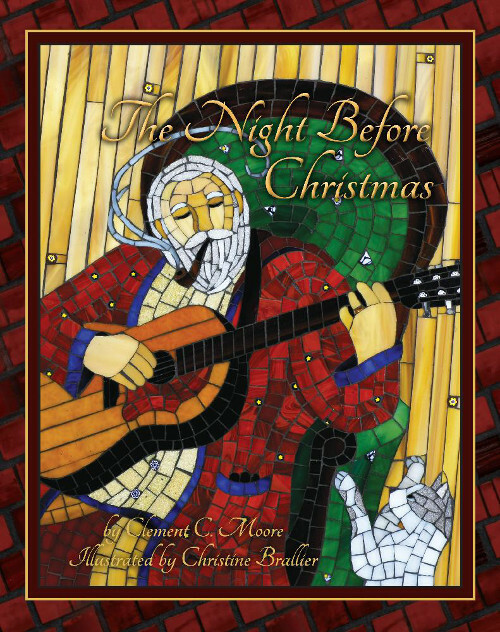 Last year, Christine released her first picture book (Brownian Bee Press), The Night Before Christmas. I read it last year, but did I post about it? Nope. I had intended to, but I got busy. When I contacted her about it this year, we decided better late than never. So, she visits today to talk about how she makes her mosaics and to share process images, as well as some photos of the stained glass pieces from the book. Let’s get right to it. For those who are interested in even more information, Christine blogged here about her process from start to finish. Christine: Before I discovered mosaics, I had always wanted to illustrate a children’s book but never felt very confident about my painting abilities. Once I found mosaics in 2005, I thought, what a unique idea it would be to illustrate a book with my mosaics. About six years ago on Christmas Eve, my family and I were reading “The Night Before Christmas,” as we always do, when suddenly I thought, “I would love to illustrate this book, personalize it with my family in it, and read it every year!” So, I began the process of designing and creating fifteen stained glass mosaics over the next four years. 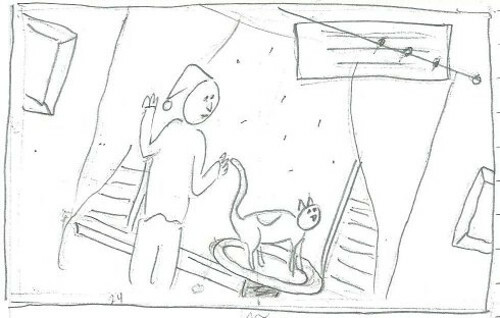 The first thing I did was draw quick 2×3” thumbnail sketches, not thinking too much about it — really just getting the idea of it down, the side story of the cat, etc. 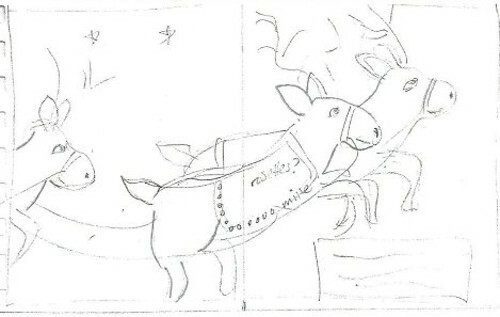 Here’s one I did of the reindeer, which—don’t laugh—look much more like donkeys! Some of my ideas changed dramatically, once I started the mosaic process, like eliminating the reindeer altogether when Santa is flying over the house. I simply couldn’t fit eight reindeer in the design, let alone one, since I wouldn’t be able to cut the glass tiny enough for all the detail that would require. I found such limitations to be a fun challenge — that is, for me to come up with something different, which often led to more creative choices and end results. From there, I did hours and hours of research on pretty much every element in the book. For example, I didn’t know how to draw reindeer (as you can see), so I spent a lot of time looking at photos to find the qualities I wanted to express. In my notes, I wrote “joyful, playful, not dainty, sturdy and strong.” I found what I was looking for in images of reindeer races. What got me was that they run with their tongues hanging out, like dogs riding in a car with the top down – they look so happy! I knew I had to include that detail in my design. I planned for an 8×10” book in the end, so I drew my final designs at 5×8”. (I draw more accurately when I draw small; don’t ask me why!) I do only a line drawing for the design and then work out all of the details, once I get to the glass cutting stage. I don’t generally color my designs in advance, as I like to work with the glass to see what looks best together. Once I have the design taped down, I play with glass colors like this. The colors on the top are too harsh. The ones on the bottom are softer and much more appealing to me, so I went with those. 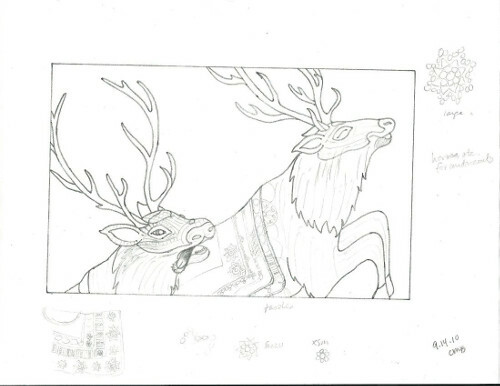 On this one, I worked out how I wanted the reindeers’ blankets to be designed. I sometimes tweak a design at this stage, too; for instance, here I decided the tongue needed to be shorter. 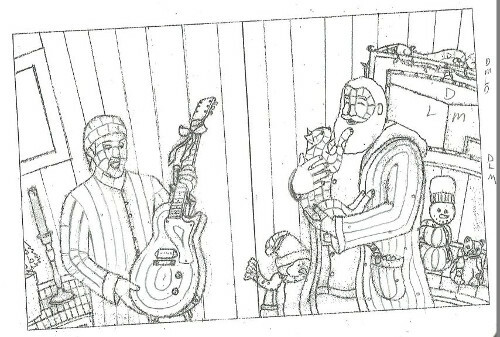 In this example, I’m working out the andamento in the cat, the guitar, their clothing, and their faces. You can see the direction lines of how the glass will be laid, as well as shapes of the cuts. The biggest part of making this book was to be able to include my family in it. 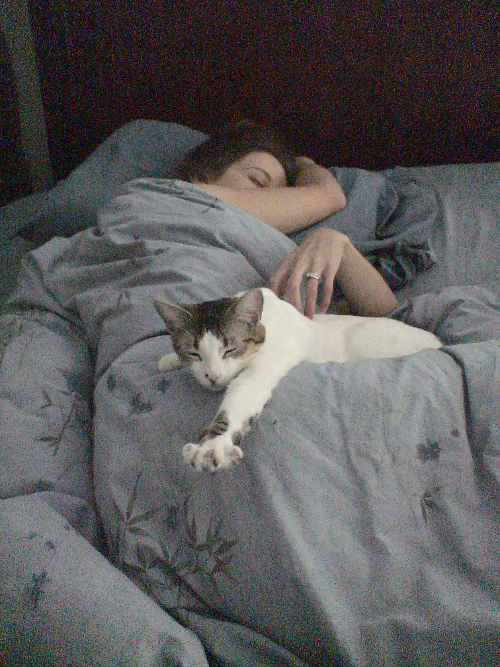 I worked from photos of my husband, myself, our son, and our cat. My husband posed for all of the pages he was featured in and even posed for some of Santa’s body positions, so I could get them just right. 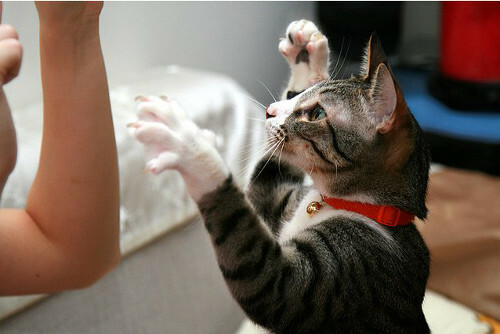 Sometimes I wouldn’t have a photo of Raymi that matched what I wanted her to be doing, so I’d do a very extensive search online for a cat in the pose I wanted. Then I’d adapt it to her colors and markings. When I finished all 15 of the mosaics, there were changes to be made. Some were minor, but others were huge. The interesting thing is that by the time I got to the final mosaic, it had been four years since I started and my technique had changed and improved. I needed the earlier mosaics to match the quality and style of the later ones. 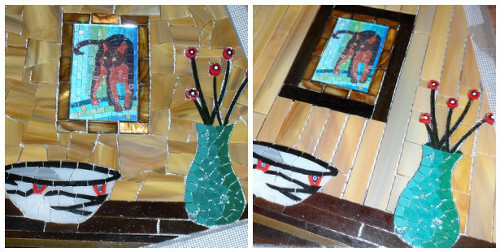 In this mosaic, I changed the wall from dark random pieces of glass to lighter, straight cut pieces and added a darker frame around the mosaic on the wall. Much better! Other changes were a matter of aesthetics. I originally did the house grey, because I wanted it to be personal to us and our house is grey. It just looked so dull against the snow, so I changed it to brick. It was an additional 17 hours to change — but worth it. This change was a necessity – I had made Santa’s bag green in the fifth mosaic, but when I got to the ninth mosaic, I realized it wasn’t going to work, because the green bag was sitting right in front of the Christmas tree and was disappearing. This is downside to not planning out all of the designs in advance. So, I had to re-do the bag in both mosaics. Sometimes I’d get partway through an area, only to realize the colors weren’t working. Fortunately, I didn’t get too far before I decided this one didn’t work for me. Finally, I’m satisfied with the mosaics but there is still a lot to do. I have to cut the boards, attach hanging hardware, transfer the mosaics to the boards, grout them, finish the edges, and paint the backs. When I went to attach the mosaics to the boards, I found that they were too floppy and unmanageable, so I had to first apply glue to the backs of the mosaics and let them dry so that hey’d be rigid enough for me to hold onto without all the pieces of glass falling off. Once they were glued to the boards, my favorite part was next, filling in all those gaps with grout. I spread the grout all over the mosaic and then wipe off the surface so that only the grout in between the glass remains. I love grouting and seeing how the mosaic changes, how it becomes cohesive and complete — and even softens the mosaic. Here is a detail from one of the mosaics, before and after grouting. I did it! Thanks so much for reading about my process. All images are copyright © 2013 by Christine Brallier and used by her permission. 1) The girls are off from school for the holidays, and this always means more time to read together. We’re reading a handful of good novels right now. 3) I so super bad wish I could see this show. 4) Last Tango in Halifax. 5) A kicker shared his writing with me, and it was a pleasure to read it. 7) My husband was in Portland this past week and snapped this picture of our book in Powell’s. That was fun to see. Thanks, for sharing the process, Christine. Looks beautiful. Jules – Congrats on leveling up. I am looking forward to being home with my kids this holiday break, it’s been a while. 4. Celebrating my husband’s birthday and having a big crazy open house today. 5. Reading the Lisbeth Zwerger, illustrated Christmas Carol like I do every year. 7. Knowing that I’m going to get lots of hugs this week. One of my favorite books as I love the art interpretations. This book is incredible. How incredible. What is she creating next? Jules, how accomplished did you feel by going to the next level of lessons? I think I have to go to Powells over the break. Enjoy your girls. Moira,happy birthday to husband. Enjoy your open house. 1. School’s out for two weeks. 2. Driving to Salem for breakfast with a friend yesterday. 3. Participating ing “Funky Friday” with two of the fourth grade teachers ( one plays bass guitar rand the other harmonica). Totally fun. 4. Another bass performance all day in the library. The 16 yo son of a fifth grade teacher attends Colburne Music Conservatory in LA? He played his double bass all day for classes. Beautiful. 5. So Friday was music day, that night, met a friend and went to hear our friend play in his blues band (aka fourth grade teacher above who play harmonica. Good morning, Imps! Happy holidays! Christine: Thank you for sharing your artwork with us. I love the attention to detail, the textures and patterns. 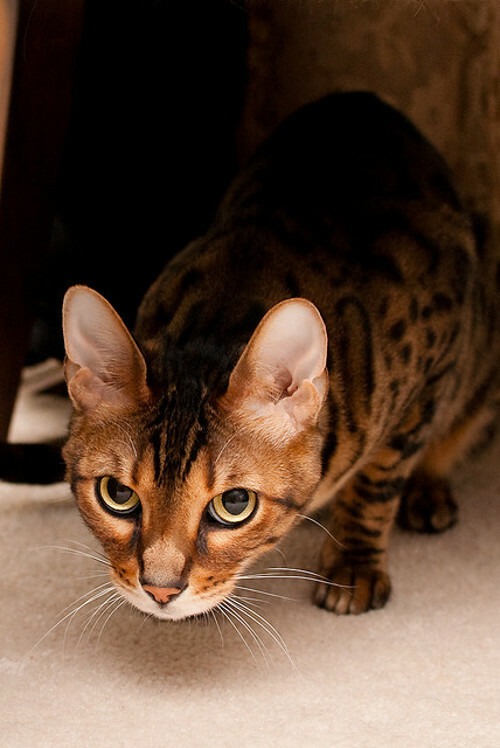 The cat is so adorable, right down to the paws and striped tail! Hi, Raymi! Jules: Congratulations in your piano work. Happy hoolidays to your family. 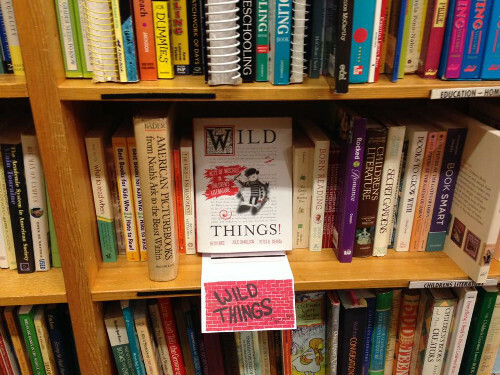 Yay for Wild Things photographed out in the wild! Moira: Happy birthday to your husband! Jone: Enjoy winter break. Congrats to the bass player and the blues player. Wow. What beautiful artwork. Simply stunning. And oh my goodness, how cute is Raymi? 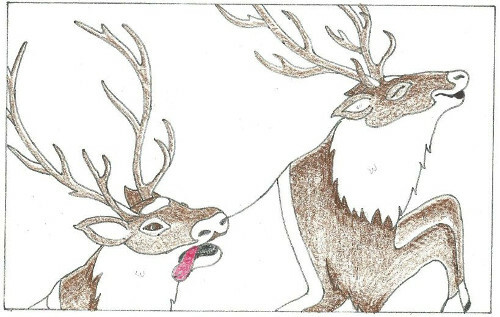 Also, so incredibly cool to learn that reindeer run with their happy tongues out. Jules – I soo wish I could see that show too! Damn. That’s some serious metalwork there. Think I’ll have to hit the DQ to make up for not being in Chicago to see that. Congrats on graduating, and enjoy your holiday break with the girls! Moira – hooray for super report cards, your last day at the office, & happy birthday to your husband! Jone – music Friday sounds like it was wonderful. Enjoy your 2 weeks off! LW – 5,6 & 7 are awesome kicks! I’ve been overindulging in movies of late. Break a leg, as always! 2) Delivering tins of Christmas goodies on Friday. 3) Winning a Rock Paper Scissors contest Friday night. 4) Read “Wild,” in preparation of seeing the movie with a friend. 5) Fun business lunch with a good friend. 7) Plans for a fun Christmas with kids, friends, mimosas and games. 7.5) Got a flat tire on Monday, and there was no line at Les Schwab! Totally awesome way to deal with a flat tire repair. Happy Hannukah and Merry Christmas everyone! Wishing everyone magical holidays! LOVED seeing the thought process. Thank you for sharing, I am a big fan of Christine Brailer! Rachel: Sending good wishes to your niece and family. Congratulations on the Rock Paper Scissors win! Do you compete? I have heard of the big network of competitions but never attended nor participated. Any Imps who have watched the TV series BLACK MIRROR? Let’s discuss! Love stained glass and yours are awesome. What a wonderful way to illustrate a book. 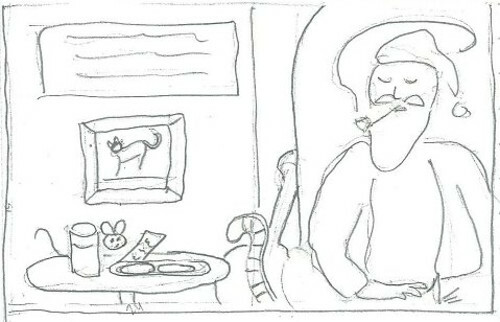 Funny thing: I couldn’t think of a post subject for tomorrow, so I parodies Twas the Night Before Christmas. I hunted all over the net for illustrations to use. I would love to have used one of yours and credited you because these are wonderful. I think I will go back into the post and tell readers to read this post. Moira: LAST DAY! Lots more studio time to come. Exciting! Happy birthday to your husband! Enjoy your school break, Jone. And, yes, it felt good to “graduate,” though I have a WHOLE lot to learn. Christine, thanks again for visiting. LW – this was my first RPS competition, but I will compete at anything. And thanks for the good wishes, we are all excited for this newest family-member-to-be. Jules – this was the kids’ game in its purest form, but in a bar, single elimination rounds, and no throws other than Rock, Paper, or Scissors allowed. I won a t-shirt and a gift certificate to Full Sail Brewing Company here in Oregon. The last round my competition was a gentleman in a kilt, and we tied 5 times before I finally won, with a throw of scisors to his rock. And of course, Miss Daisy is always a kick, I just forgot to list her. Although kick #9, after heading out to look at Christmas lights and get a Spanish Coffee with a friend, I came home to a tin of goodies and card on my porch for Daisy and I – she has made me very popular with the neighbors because she is so sweet. These stained glass illustrations are amazing. Thank you Christine Brallier for sharing your process with us. I will thinking of your book when I read this story until my copy arrives. Here’s to sharing great books with your girls, Jules. I love planning for the holidays too, Jone. I listen to music for inspiration every single day Little Willow. I know how you feel. I really like delivering Christmas goodies too. It’s especially fun when it’s a surprise, Rachel. 1. Finished the Mock Caldecott unit at school, the students voted and we Skyped with our partner school in Illinois. 5-7 Spending time with Xena and taking walks. So thankful to still have her. Hope everyone’s holiday is filled with love. Rachel, I so totally wanna play that in a bar! Congrats again. Margie, may I ask what won the Mock Caldecott? I’ll check your site too. Wow, the process you go through with the mosaics is incredible! No wonder they’re so gorgeous. Congratulations! Thank you all for reading about my artwork and taking the time to comment. 🙂 Happy Holidays! I really enjoy looking at fellow mosaic artists’ work. Yours is delightful as well as beautiful, Happy New Year!